big moos, er, news in the local paper. 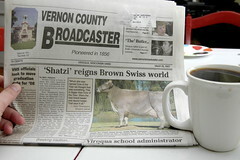 a local cow, shatzi, won the title of "production queen of the entire united states brown swiss breed" by producing over 53,000 pounds of milk in a single year. to put that in perspective, that's well over one fully loaded milk tanker - holy cow! shatzi is apparently not producing organic milk, but according to her owners she did accomplish her feat without bovine growth hormone.